Since Yahoo announced that they were shutting down Yahoo Maps, it was no surprise to hear that they are going to outsource the management of their Yahoo local listings. You will no longer go to Yahoo to manage your Yahoo listings! If you already have a free Yahoo business listing it looks like Yext is going to take it over soon. 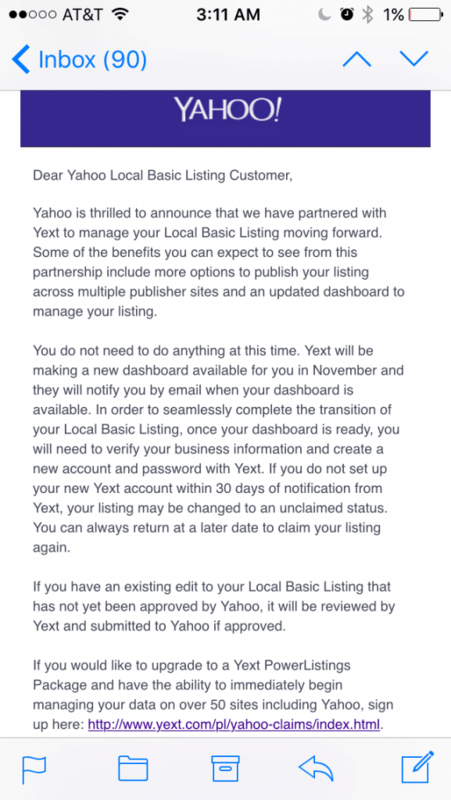 Starting in November 2015, you will log into Yext to manage your Basic Yahoo Local Listing, which will continue to be free. You will of course have the option to upgrade to one of Yext’s PowerListing packages but we are more focused on the free Yahoo listing. Yahoo has provided a helpful link with more information on what will be happening with Yahoo and Yext. The help page mentions, “Access to Yext PowerListings and related products such as a Yahoo-only listing product will be available in October, 2015.” This will be interesting to see. You will be invited to log into Yext to start managing your Yahoo listings at some point in the near future. Any changes that you make to your Yahoo listing on Yext should appear on Yahoo within 2 weeks of approval. But first it says, it has to be approved. Yext is going to implement a review process for any new listings and/or edits. Who knows how long that could take since they will have large amount of listing to review when they first launch. So for now there’s nothing to do but wait for Yext to contact you with an email, inviting you to create a Yext account and verify your email address.